ERIE, Pa. (CNS) — American flags flew from the back of many of the more than 1,000 motorcycles participating in Erie’s Roar on the Shore Bike Parade July 13. 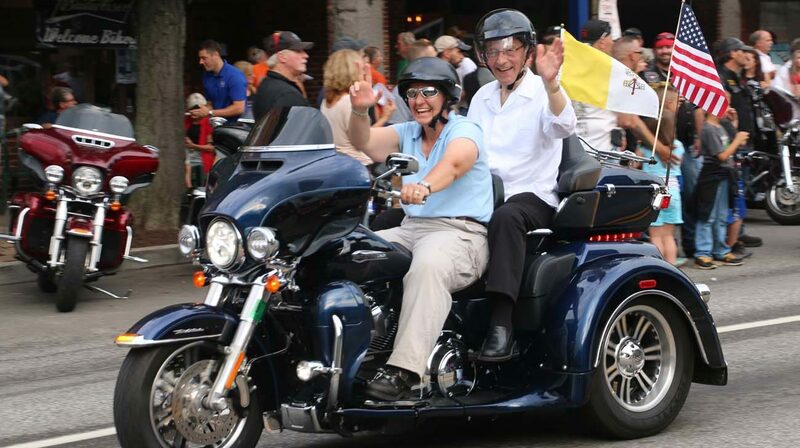 But the Harley-Davidson carrying Bishop Lawrence T. Persico of Erie was the only one that also featured a Vatican flag. Bishop Persico agreed to take part in the ride late last winter, when two parishioners extended the invitation. “All for a good cause,” he said, before hopping on board the Tri Glide piloted by Lori Follett of St. John the Baptist Parish in Erie. Some of the proceeds from the 11th annual bike rally, a summertime staple in Erie, will benefit the Mercy Center for Women, an outreach of the Sisters of Mercy that provides safe and supportive transitional housing, education and counseling for homeless women in the region. Bishop Persico, who had never been on a motorcycle before, said the event was a good way to show off the city and its hospitality. “It’s a great boost for the community,” he said. Roar on the Shore, founded by the Manufacturer and Business Association of Erie, has raised $800,000 for charity over the past 10 years. The rally concluded July 16 with the traditional blessing of the bikes by the Christian Motorcycle Association. Welsh is managing editor/senior writer at Faith, the magazine of the Diocese of Erie.